Just the other day, we were enjoying a pint of Ben & Jerry's "Nut-Stuffed Cramocha," thinking about all the good nutrients we were getting from those nuts. Mmmm... nutty. Nuts are, of course, truly excellent foods, though we recommend you try forms other than nut-laden dessert treats. Today we'll explore the ins and outs of nuts via a guest article made available by The Green Guide. On every continent and for thousands of years, nuts have been an important food for humans, and for good reason. Nuts are good for you—they are cholesterol-free and contain healthy, unsaturated fats which can help lower the risk of heart disease. Nuts also provide magnesium, which helps maintain bone structure; and chromium, which helps to ensure proper insulin function. They contain zinc for growth and wound healing, and manganese, which protects against free radicals. All nuts are a good source of vitamin E, an important antioxidant. Like all plant foods, they are high in fiber and phytochemicals—both of which help protect against cancer and other chronic diseases. Nuts are dried seeds that can be eaten raw, toasted, pureed, or used as flour. There are many different types of nuts—almonds, Brazil nuts, cashews, filberts (also known as hazelnuts), macadamia nuts, pecans, pistachios, walnuts, and pine nuts. Two legumes, peanuts and soybeans, are often considered nuts (though this is applied to soybeans only when they are dried and toasted). There are a few problems with nuts you should be aware of. But don't worry; we will also suggest solutions! Aflatoxin — Peanuts are among the top three crops that are subject to infestation by molds that produce aflatoxin, a potent human carcinogen. The toxin has been found in both peanuts and peanut butter, as well as corn, rice, wheat, soybeans, and sorghum. The USDA is responsible for testing peanuts and peanut products to ensure that they do not exceed acceptable levels of aflatoxin. While new methods for eliminating these molds are being implemented, there is still some concern about the long-term effects of ingesting low levels of aflatoxin. Allergies — Peanuts and tree nuts are both on the list of the eight most common allergens. Children are more likely to develop allergies if their parents or siblings suffer from allergies to legumes or nuts, but even those with no family history of allergies are susceptible. The American Academy of Pediatrics recommends that particularly in families with histories of peanut allergies, nursing mothers should not consume peanuts and tree nuts. The American Academy of Allergy Asthma and Immunology also recommends that children under the age of three not eat peanuts. 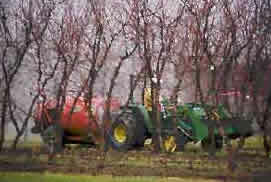 Pesticides abound in the production of nuts. A few examples follow. Endosulfan is banned in many countries but legal in the US and India, where it is used in cashew production. This pesticide presents health risks to farm workers and to those living near where the chemical is used. In December 2003, Environmental Health Perspectives published a study linking endosulfan to delayed sexual maturation in boys in India. Animal studies indicate that the pesticide attacks the central nervous system, and can cause damage to the kidneys, testes, and liver. It is highly toxic to animals and fish as well. Cyfluthrin, which has been used for decades on nuts, is known to be highly toxic to marine and freshwater organisms. Phosmet, used on pistachios as well as apples and peaches, is highly toxic to honey bees. Atrazine is one of the most widely used pesticides in the US. It is used on macadamia nuts, has been found in well water in the Midwest. It is known to harm aquatic organisms like fish and frogs, and there is some evidence that it may have a negative impact on human reproduction. Diazinon, well known for its turf and residential pest control applications, is also used on walnuts and is highly toxic to honey bees and birds. Once harvested, nuts are often fumigated with methyl bromide, a toxic pesticide. While methyl bromide probably won't cause any harm to you when you eat nuts or other treated crops, it is quite dangerous for the farm workers who use it. Also, it is such a large factor in ozone depletion that the countries around the world are phasing out its use. The way to minimize your intake of pesticide residues and to induce nut farmers to turn to organic production is to choose organic or wild nuts. Unfortunately, less than 1% of US farmland dedicated to producing tree nuts is certified organic, and as of 2001, there were only 19 states that produced organic tree nuts. Additionally, small farmers may not have large enough production numbers to receive USDA certification. The good news is that larger organic nut farmers will carry the USDA certified organic seal (or the seal from one of the USDA-accredited certifying agents), and your local store may stock organic nuts imported from other areas. If your favorite store does not carry organic nuts, please ask them to do so. You can also buy organic nuts online; some shopping suggestions are included below. Nuts are sold in many different forms. Whole nuts, still in their shells are less expensive and will last up to a year without going rancid; just be sure to keep them in a cool, dry place. Shelled nuts—especially if they're roasted—may last longer if they are kept in the refrigerator. If you plan on storing them longer than six months, consider putting them in the freezer. Always discard any nuts that look moldy. Choose tree nuts more often than peanuts—they are less likely to have aflatoxin. Delicious nut butters can be made from pecans, walnuts, almonds and many others. Jaffe Brothers, sells both certified organic and conventionally grown nuts, dried fruits and grains. Nuts can be purchased in-shell or shelled. They produce their own organic almond, cashew and peanut butters, which can be purchased as a nut butter sampler, three 1-pound jars for $21.70. (760) 749-1133; www.organicfruitsandnuts.com. Trufflebert Farm in Oregon offers 25 pound bags of USDA-certified organic shelled hazelnuts for $7.50 per pound. (541) 686-6186, ask for Ken. Living Tree Community sells almond butter, certified organic nuts, and dried fruits. www.livingtreecommunity.com. Sun Ridge Farms sells conventionally grown as well as USDA-certified-organic almonds, cashews, pumpkin seeds, soy nuts. Order on-line at www.sunridgefarms.com or use their store locator to find stores near your home. At Grinning Planet, we rarely think "don't" when we hear that candy-bar jingle, "Sometimes you feel like a nut, sometimes you don't." Anyway, nuts are not only a good source of vitamins and enzymes, when combined with grains, they are a good source of protein too. So go nuts! P.S. If you want additional places to find nuts in your locale, try Local Harvest. Know someone who's a nut lover (or who should be)? "True, nuts are high in fat, but most of them contain mono-unsaturated fat that is good for the heart. In fact, eaten in moderation, nuts can lower your risk of heart disease and heart attack."